Ever have a 30 pound-plus Salmon or Trout, on line and realize that it is the dream catch of a life time? Well most of our clients have, and even bigger. It’s a thrill you’ll never forget, it will stay with you forever. Rochester New York has been recently rated as one of the top 10 places in the United States for sport fishing. 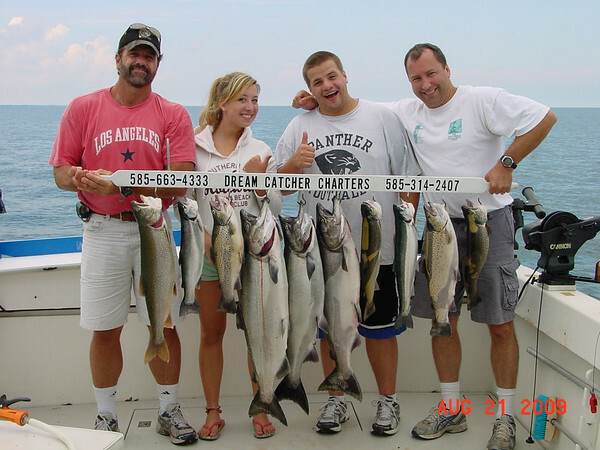 Go salmon fishing on Lake Ontario in Rochester NY with Dream Catcher Charters. Over 20 yrs. experience. Find out why most of our customers are repeat and referral. OUR PROFESSIONAL SERVICE IS OF THE HIGHEST STANDARDS AND UNSURPASSED, PERIOD! Member of both the Lake Ontario Charter Boat Association and Genesee Charter Association. Dream Catcher Charters with Captain Sam Zucco - Welcome Aboard!